When the Nintendo Switch launched back on March 3, 2017 many early adopters were concerned by the lack of titles on store shelves. Even the Switch eShop was somewhat barren, but just a few days after launch Inti Creates released the excellent Blaster Master Zero, a sort of remake of the NES classic. Not only did it look great and feature fantastic gameplay, but it made excellent use of HD Rumble and maintained enough plot surprises to keep veteran fans guessing. Imagine my joyous surprise when out of nowhere Blaster Master Zero 2 was released out of the blue with no hype build up or months-long delays. It was simply ready to play, and play it I did! The first thing you should know about Blaster Master Zero 2 is that it’s the real deal. It’s a full-blown original sequel (as a side note I never understood why the NES game didn’t get a sequel on the Super NES) that’s just as addictive and entertaining as the first. This one puts slightly more emphasis on the story telling, although to be honest it’s pretty paper-thin as far as plots go. Still, the short exposition pieces strewn throughout the adventure help to tie everything together. On the surface many things appear to be the same. You still roll around in a futuristic tank, jumping and shooting your way through alien landscapes. You can get out of your vehicle at any time and when you go into caves and dungeons the view switches from a sidescrolling 2D action/platformer to an overhead Zelda-like affair. If you’ve played the prior games in the series, this is nothing new. That’s not to say there aren’t new weapons, sub-weapons, and power-ups, because there is! One of the coolest upgrades to your tank is that it now has rocket boosters on the back, which allows it to shoot up into space. Here you’re treated to a small map of the solar system so you can fly around to different planets and asteroids and explore to your heart’s content. You’ll unlock wormholes that allow you to warp to different galaxies and discover new worlds to blast through. Unlike the prequels where you collect special power refills for your sub-weapons, a new mechanic is introduced whereby you must fall a distance to smack into the ground and replenish your special energy bar. The higher the fall, the more that is refilled. This may seem strange, but once you play the game it makes sense and it’s a fun addition to the gameplay loop. This also means that many of the areas feature more verticality, which I appreciate in games. It’s not just your vehicle that has received upgrades, but Jason also has some new tricks up his sleeves. The most helpful one is his ability to dodge incoming fire and counterattack. This is easy and insanely fun to execute. At certain points a small cursor will appear over attacking enemies. If you hit your dodge button at this exact moment you’ll be able to direct a counterattack against the enemies, and eventually through skill and power-ups you’ll even be able to warp about the screen and attack multiple foes at once. This is not only fun, but stylish as well. To prevent the player from spamming this powerful countermeasure over and over, there is a special gauge that drains every time the move is used. Luckily it refills automatically and it doesn’t usually take too long before you can go at it again. Practice makes perfect with this new move and it will save your skin over and over again. Plus, like I said, it’s just plain cool to use! The amount of content in Blaster Master Zero 2 is impressive. Most gamers will probably take about 8 hours to get through the game – maybe longer if you get stuck in an area. Don’t worry about dying, the save system is quite generous. I died over and over again on some of the bosses and, despite becoming frustrated a few times; I just kept going at it until I prevailed. There are some truly epic boss encounters, including one that towers several screens tall and requires you to use your tank for some segments, and then you have to exit and go inside the mechanical beast to take it out from inside. It’s pretty dang cool and there are all sorts of fun bosses to fight. The presentation is superb throughout. It features an 8-bit pixel art style that is reminiscent of the original NES game, but with more colors and bigger sprites and no flicker or slowdown. This sequel also looks slightly better than the last, but they did try to stick with the 8-bit look instead of going all out with a 16-bit style. I’d love to see the developers implement more parallax scrolling and maybe some multi-tiered dungeons like those seen in Zelda: A Link to the Past. The music is also great with some very awesome chiptunes that do a great job of setting the mood. Combine eerie with a rocking beat and you have a dynamic and fun range of music to listen to. 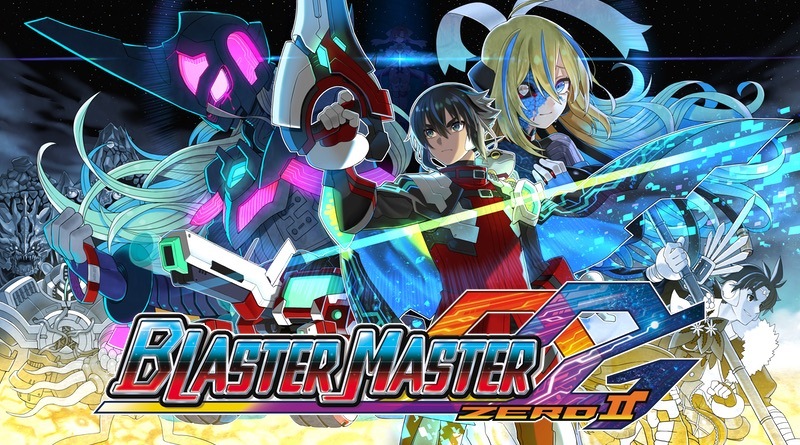 Blaster Master Zero 2 combines the familiar with the new. Veterans of the series will feel right at home controlling the tank and finding original modifications, like the hover ability, for the tank. Likewise new options, like the wall hop, are fun to mess around with. Jason’s new dodge and counterattack add a ton of fun to the overhead sections and I loved the feeling of constantly finding new items and power-ups to mess around with. Fans of the series will surely love this new sequel. If you’ve never played any of the games before, this one is approachable enough for newcomers, but just be warned that it’s not a walk in the park. You will die – most likely a lot – but it’s still a blast and one that you shouldn’t pass up! Inti Creates does it again with Blaster Master Zero 2! This sequel is filled with all sorts of new gameplay mechanics that are really fun to mess around with. There’s a lot of areas to explore and abilities to learn that will help mitigate the game’s somewhat high difficulty curve.